As I have mentioned on and off in past posts, I've been working on installing operating signals on a portion of the layout. Over the past several weeks, the last pieces have come together and the system is now working. I'm using the Signals By Spreadsheet (SBS) hardware and software and I'll provide some more detail on this later. I'm also using the signal aspects and indications used by the Chesapeake and Ohio Railway and there will be some more information on that later as well. The goal is to eventually have full CTC control of the railroad from a remote dispatcher's panel and I've built the signals with that in mind. Fortunately, the SBS system is designed so that you can get bi-directional automatic block signals (ABS) up and running prior to developing the CTC system. This allows you to establish all of the required blocks and corresponding detection, get the signals built and in place, and develop the programming of the signals in steps. Gerry Albers, who developed and markets the SBS product, strongly recommended that I get all of the detection in place and the signals working before starting on CTC. Getting the bi-directional ABS system up and working is a tremendous amount of work and there's much to be learned in the process that will aid the development of the CTC system later. It should be noted that bi-directional ABS must be overlaid with a traffic control system such as time table and train orders or track warrants in order to provide conflict free movement authority. Thus we will continue to use track warrants until the full CTC system is up and running. The section of the railroad that is now under ABS runs from Petersburg Junction to Cedar Falls Junction. This area includes Big Chimney, WV and the passing siding there along with the Purgittsville Branch and the Elkwater Branch. Let's take a quick look at this area. Looking east toward Big Chimney, we see the signal at Petersburg Junction controlling the Purgittsville Branch in the foreground and the signal controlling the eastbound entrance to the passing siding at Big Chimney in the background. Here's a link to the track plan so that you can follow along: http://cwerailroad.blogspot.com/search/label/Track%20Plan. Note that there are no westbound movements approaching this section of the railroad as indicated by the Clear aspects. Also note the signal on the Sand Fork Branch which is displaying a Restricting aspect. This is the first of two signals on the branch before the connection with the main at Cedar Falls Junction. Looking back west at Petersburg Junction, we see that the turnout is thrown for the main and the line is clear. At the west end of Big Chimney, we see the signal governing westbound movements at the west end of the passing siding. Note the Stop aspect for the siding as the turnout at the west end is lined for the main. Looking at the east end of Big Chimney we see that the turnout is lined for the main and there are no movements in the area as indicated by the Clear aspect. The signal governing the westbound approach to the east end of Big Chimney also shows Clear. So here's some video of the system in action. My apologies for the small size of the screen and the noisy Tortoises. Here's a link to larger versions of the videos which are posted on YouTube: https://www.youtube.com/channel/UC3Ha3Ex63IH5qdu7nCjHF_A/videos. There is a local moving west and a way freight heading east toward Big Chimney. The dispatcher wants to arrange a meet there and have the local take the siding. He throws the switch for the local to take the siding at the east end of Big Chimney. As the switch is thrown to the siding on the east end, the westbound signal drops to Approach indicating to the approaching local that the next signal will be Stop. The turnout at the west end of Big Chimney is lined for the main and the local will face a Stop signal at the end of the siding. As the local enters the block before the turnout, the eastbound signal on the siding drops to Stop. If there had been a train in the siding when the turnout was thrown for the siding, the westbound signal would have dropped to Stop. Now the local comes down the hill from Cedar Falls Junction and heads toward the siding at Big Chimney. As the locals moves into the clear in the siding, the dispatcher throws the turnout at the east end back for the main. The signal for the eastbound main now shows Clear for the approaching eastbound way freight. The momentary Clear signal eastbound from the siding in this short clip came about as the caboose cleared the block that contains the turnout. As there are no westbound movements in the blocks behind the local, the eastbound signal from the siding would show Clear as long as the turnout remained lined for the siding. Next time, we'll watch as the eastbound way freight approaches the local in the siding at Big Chimney. Until then, here's wishing you a very Merry Christmas! In between working on signals and installing resistors on wheelsets, I managed to finish a couple of boxcars recently. The first car is V&O 33786 which began life as an NMRA Division 7 project car. John Miller had a number of these kits and gave me one that had the original number scraped off. He intended to re-number the car but realized at some point that he had enough V&O cars on the K&LE. Rather than try to match the original paint, I simply added a piece of Micro Scale trim film to make it appear that the original number had been painted over when the car was re-numbered. I added a few additional decals to bring the car up to my era and then weathered it using artist's acrylics and powders. For the roof, I found a number of shots of Great Northern boxcars on the web and used them for references. Next up is an Atlas 60' auto parts boxcar decorated for the DT&I. I added an ACI label and then weathered it using the same mediums as the V&O car. For the roof, I found a number of photos that captured the look I wanted to achieve to use as references. I then tried the techniques described by Gary Christensen in his article in the August 2104 issue of Model Railroad Hobbyist. Here's a link to the article: http://mrhpub.com/2014-08-aug/land/#76. Gary does some absolutely beautiful work and I've followed him on the Rustbucket forum for some time now. Here's a link to the Rustbucket: http://tws-rustbucket.com/. You have to register to get into the site, but it's free and well worth the time and effort. The work being done by a group of people on this site is some of the most fantastic weathering ever done. As described by Gary in his article, the base rust color is a 50/50 mix of charcoal grey and burnt sienna craft paints. I applied this coat with a cosmetic sponge in order to get random, "pitted" look. Once that was dry, I applied Transparent Orange Oxide oil paint with a cosmetic sponge in order to add some depth and additional color to the roof. That was it- what you see in the photo above was achieved with just these two simple steps. A special thanks to Gary Christensen for sharing some of his beautiful work along with his techniques. At some point in near future, we'll take a look at recent progress on the signal system. Yesterday, I was sitting at my laptop working on the signaling program and I glanced over at the layout. I was just about at eye level with the track and it struck me that it might make a neat photo. And Randy Seiler recently took a bunch of really great close-up shots on John Miller's Kanawha & Lake Erie which got me thinking about some different angles to shoot on the CWE. So here are a couple of shots from some slightly different angles. The next shot shows the eastbound signal at the west end of Big Chimney. I'm working on getting ABS up and running on this section of the layout. Of the fifteen signals in this area, 12 are now wired and operational and all of the block detection boards are in place. The Signals By Spreadsheet program is up and running thanks to the assistance of Gerry Albers. And here's what the area looks like right now as I make like a mole and crawl around under the layout hooking up wires. While I had hoped to have the signals operational in this area for upcoming session in January, it occurred to me the other day that I will need resistors on wheel sets in order to make that happen. Sigh... The resistors and the paint have been ordered, but there's just no way enough cars will done to make all of this work by then. Buying wheel sets with resistor on them is an option, but as my friends will tell you- I'm way too cheap to do that. Guess we'll just have to wait until the shop forces can get enough resistors installed. 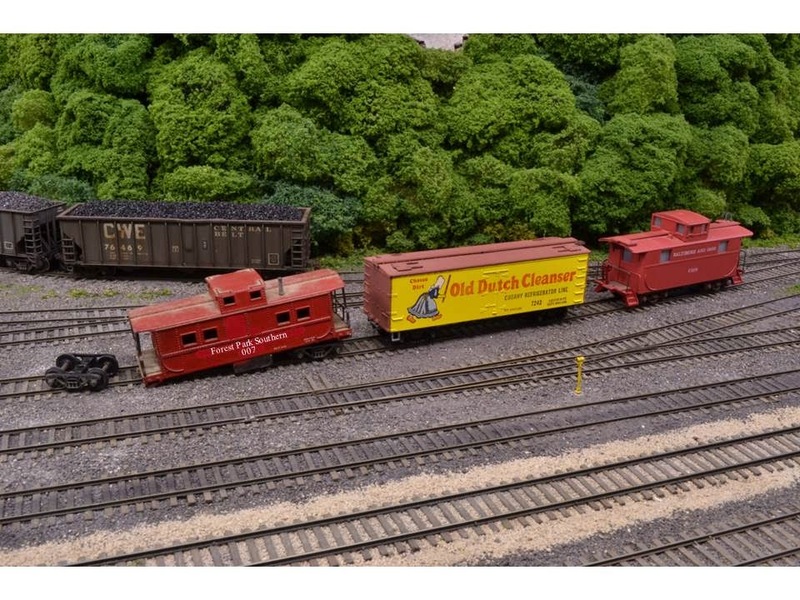 After numerous complaints from C&O fans about the condition of the caboose in the last post, it became clear that the car should be re-lettered to reflect its original owner. So check the "Yet Another Special Boxcar" post to see the correction. My sincere apologies to all of you Chesapeake & Ohio Railway fans. As a result of the recently expanded west staging, it's become apparent that the CWE going to need a lot more locomotives and rolling stock. Ever the good friend that he is, Bill Doll stepped up to assist in my efforts to expand operations. At one of the last Monday morning work session on the K&LE, he handed me several boxes. The first three contained the equipment in the photo below. Bill's keen eye for the nuances of eras and observation skills clearly told him that this equipment would be a great fit for a 1970's era, coal hauling railroad. And while the caboose on the right at least appears to have both trucks and all of its wheels, it rolls as well as the one on the left without the truck. This equipment will certainly help fill out the roster! Needless to say, I was a little apprehensive when I opened the fourth box. Inside was an Athearn 50' plug door boxcar painted and lettered for the Forest Park Southern. Bill even went so far as to remove the roofwalk to reflect how it would look in service circa 1976. I added an ACI label and a little weathering as you can see in the pictures below. It's a great looking car and it's neat to have some FPS rolling stock on the layout. One good turn deserves another, as they say, and I have been the beneficiary of several nice freight cars over the last several years. So in order to show my gratitude for this most recent addition to the fleet, I painted and lettered a CWE car in the mid-1950's paint scheme. I had designed this paint scheme many years ago when I first developed the concept of the Chesapeake, Wheeling & Erie Railroad, but nothing had ever been lettered this way. This is the first car in the "early" scheme. This boxcar was delivered to the FPS last Friday night. With any luck, it might actually appear regular revenue service at some point. I've been blessed over the last several years to have met some really fine people. Thanks again for the beautiful freight car, Bill, but most importantly, thanks for your friendship. This past Saturday, the last regular operating session on the Kanawha & Lake Erie took place. It was a bitter sweet day for anyone who has been involved with current version of the K&LE over the years. John Miller and his wife Page have purchased a new home and will be moving in the next month or so. The bad news is that the layout will come down soon. The good news is that John has over ten acres at his new place and intends to build a separate building for the new version of the K&LE. Portions of the old layout will be saved for the new location and John is looking forward to expanding on the current theme. It only seemed fitting to capture some of the action during the last session. The photo below shows the crew gathered for a group shot right after lunch (photo by Stuart Thayer). Undercliff Yard is always a hub of activity with trains originating and terminating, through trains making set-outs and/or pick-ups and local traffic between transfer runs and Oasis Yard, which distributes all the cars destined for local industries. In the photo below, Bob Bartizek is working as the west end switcher while Jim Rollwage is working on a cut of cars in Oasis Yard. In addition to the west end switcher and the yardmaster positions, Undercliff also requires an east switcher who's primary duty is to classify inbound and outbound cars and make up or break down trains. 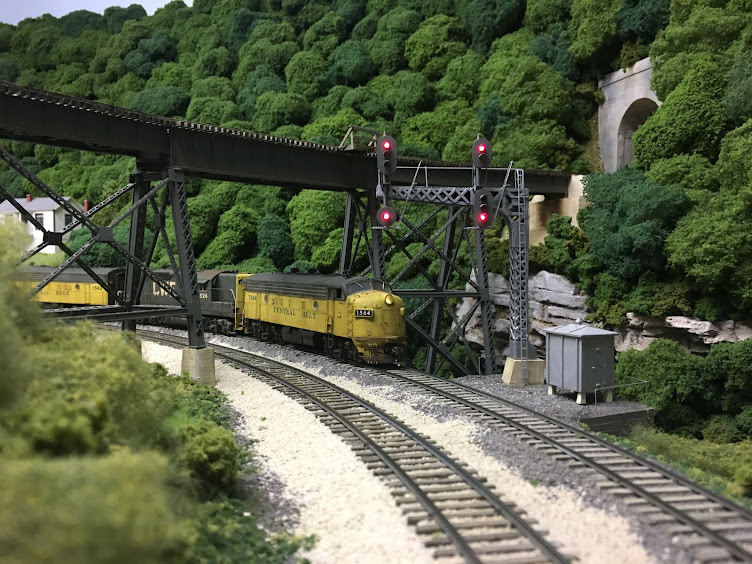 In the photo below, Matt Snell is working the east end switcher job while George Roos brings a manifest freight through on the main. The superintendent is watching the action, complete with his banana yellow apron. The next shot will give you an idea of the overall size of Undercliff Yard. The picture was taken from where Bob B. is standing in the first photo above. Out on the road, Debie Snell is taking a freight east through Milford while Randy Seiler is working east end of St. Joe where the grain terminals and oil depots are located along the Ohio River. Later in the session, Stuart Thayer has brought the Hillsboro switcher west to work the local industries at Milford. Out over the industrial bottoms of Cincinnati we see (l to r) Perry Simpson, Anthony Hardy and George Roos working the industries and coordinating moves with the transfer runs. In the same area as above, we catch the tail end DC7 (DT&I run-through train) running through the street trackage as it heads west. Like many in the hobby, John was heavily influenced by the work of Allen McClelland and his legendary Virginian & Ohio. The V&O line east out of Dayton went through Hillsboro, as does the K&LE, and this gave John the opportunity to include several V&O through freights in addition to having a V&O local come into Hillsboro to serve a group of industries. In the photo below, we see VO 91 coming into Undercliff Yard where it will set out a block of cars. Having made its set-outs, VO 91's power backs down to its train. Toward the end of the session, Bob B. continues to work the west end switcher while Greg Stevens brings another freight through Undercliff. Bill "Smokey" Doll usually works as the east end switcher, but he wasn't able to attend this session. All of us are fairly certain that his absence was the only reason Undercliff Yard looked like it did in the picture below at the end of the session. I think I can speak for all of us in extending John Miller a huge thank you, not only for everything he has done to make this railroad what it is, but also for allowing us to spend some time running it. It really doesn't get much better than this and we were all very fortunate to have been part of the K&LE. Thanks, John. It occurred to me this morning that we are half way through October and there hasn't been a single post to the blog yet this month. So here's a quick update on what's been happening over the last thirty days or so. The U30C below has just rolled out of the CWE shops. The loco is headed for the K&LE where it will be teamed up with the L&N U30C in the picture and be assigned to grain train service. Its first revenue run will be this Saturday during a K&LE op session. The signal system that I've mentioned in the past has begun and the photo below shows the first DIO boards and detectors installed. These boards are made by Signals By Spreadsheet and you can find more information on the signal system and products here: http://www.signalsbyspreadsheet.com/. My goal is to get the system up and running with ABS and then eventually move to CTC. In addition to installing the hardware, I've been working on the spreadsheets for the signals and DIO boards. I've also been documenting all of the work on the signal system along with modifying and re-documenting the electrical system. More to come on this in the future. Over the past month, I spent several Fridays with Bob Bartizek taking pictures of his beautiful Pennsylvania & Western layout for an upcoming article. Here's one of my favorite shots from those sessions. There are two Atlas standard cupola cabooses in the paint shop along with several boxcars to be weathered. An SD45 is painted and ready to be reassembled and weathered. There are a handful of hopper cars in various stages of completion. At last but not least, several new signals for Petersburg Junction are under construction. So while the posts may have been a bit sparse recently, there's been a lot taking place behind the scenes.